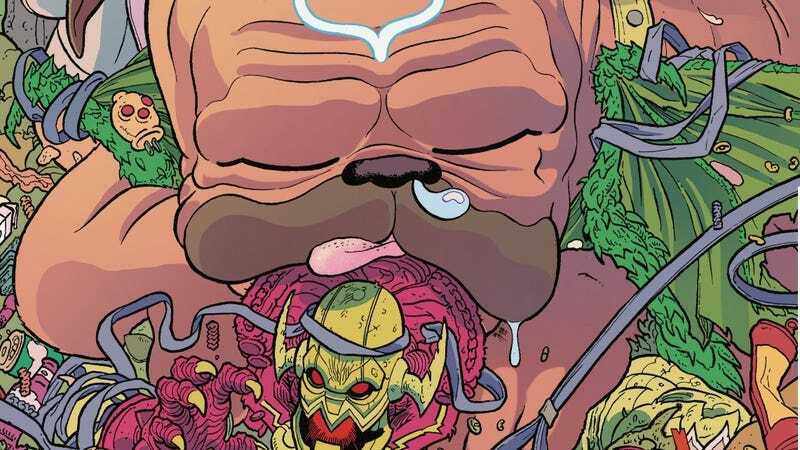 You’d expect a miniseries about an oversized teleporting bulldog to be a lot of fun, but the creative team of Marvel’s Lockjaw has gone above and beyond to create an exciting superhero adventure that showcases the wide scope of the Marvel Universe. Written by former Clickhole associate editor Daniel Kibblesmith with art by Carlos Villa, inker Roberto Poggi, and colorist Chris O’Halloran, this title pairs the Inhumans’ lovable canine companion with a superhero loser, Dennis “D-Man” Dunphy, on an interdimensional journey to find Lockjaw’s brothers and sisters. They’ve encountered Ka-Zar in the Savage Land, teamed up with Spider-Ham in the cartoon-inspired Larval Earth, and, in next week’s Lockjaw #4, they venture into The Mindscape, where they take a trip through Lockjaw’s memories with the help of Sleepwalker and his pet, Dogwalker. This exclusive preview of the miniseries’ conclusion reveals the latest change to Lockjaw’s origin: He discovers that his mother was kidnapped from Earth so that Inhuman scientists could experiment with Terrigenesis in the womb before attempting the procedure on the unborn prince. It’s a sad story that’s balanced by humor, and Kibblesmith has successfully created high stakes without losing any of the comedy you’d expect from a Lockjaw/D-Man partnership. Villa has done strong work maximizing the expressions of the book’s canine characters, and each issue has a very different visual feel that matches the dramatic shifts in environment. Poggi’s inks reinforce the crisp details in the line work, and O’Halloran’s colors are essential in setting the tone, with a vibrant palette that brings out the lighter elements of the plot. This has been a very fun series, and it’s brought emotional depth to a character that has primarily been defined by his cuteness.